I can't honestly tell you how long we've been fans of Juicy Juice in our house. My son is now 16 and I can remember giving him watered down juice when he was learning to drink from a sippy cup! He wouldn't go for plain water so this was the next best step to keep him hydrated without giving him sugar overload. So much has changed since then with their new lines of juices...so there's no more need to water it down even! 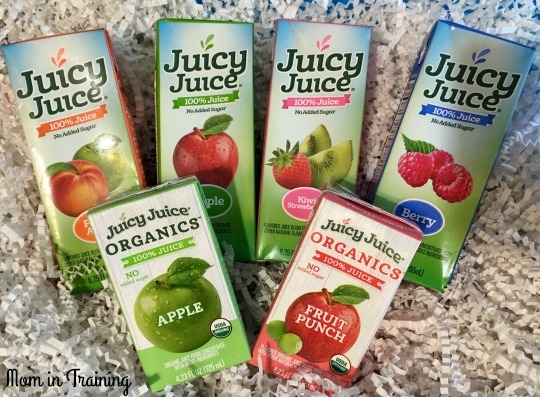 As a mom I'm now happy to provide my kids with a box of Juicy Juice in their school lunchbox. I've even been known to use Juicy Juice in recipes when they call for fruit juice. I mean why not they have great fruit flavors, and they are 100% juice! Iconic kids’ beverage brand, Juicy Juice helps parents pack the perfect lunch. Whether you have a picky eater or need lunchbox inspiration, Juicy Juice offers a variety of better-for-you beverages in kid-favorite flavors like Apple, Fruit Punch and Berry that contain no high fructose corn syrup, no cane sugar and no artificial sweeteners – including the brand’s popular line of 100% Juice, Juicy Juice Splashers, a 50/50 blend of fruit juice and filtered water in a pouch, and the all-new Juicy Juice Organics.